The popular daytime talk show “The Real” delivers real women’s perspectives on everyday topics. This year the GOBCC is bringing the show to you. Get ready to talk about it all… This years Women’s History Month theme is Women in Business & Labor, fashion, family, school, social life, politics, & partners. It’s time to get REAL! 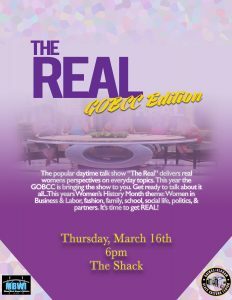 The Real will be held on Thursday, March 16th at 6pm in The Shack.